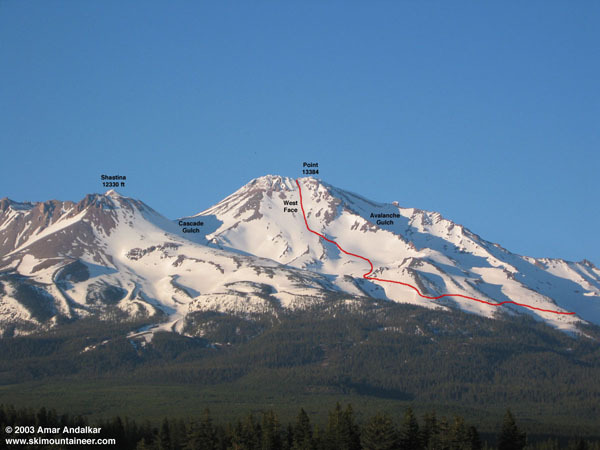 The West Face of Mt Shasta is one of the best ski descents in the Cascades, providing a 4000 vft drop from the summit plateau at 13300 ft down into Hidden Valley at 9200 ft, at a maximum pitch of 35-40 degrees on the upper part. The standard route up Avalanche Gulch provides the easiest access to the top of the West Face, since climbing the face directly requires a lengthy traverse from Horse Camp to Hidden Valley. Driving from Mt St Helens, I reached Bunny Flat on Mt Shasta late in the day and car camped. Corey & Cyril had arrived earlier and skied up to set up camp at Horse Camp that afternoon, followed by an evening ski run on the SE slopes of lower Casaval Ridge. At 4 am the next morning, I skied up to their camp, delivering a wake-up alarm at 5. By 6 am the three of us were skinning up the slopes of Avalanche Gulch, rapidly softening in the morning sun. Corey turned on the jets and skied far ahead, leaving Cyril and me behind at the base of Misery Hill (13200 ft) around noon. The two of us had summited Shasta before, so we traversed left to go rest at Point 13384 above the West Face, while Corey went ahead to tag the summit for his first time. He returned to meet us around 1:45 pm, reporting good skinning on the summit plateau, but typically nasty sastrugi on the summit pinnacle during the ski down. We launched down the West Face just after 2 pm, finding the snow still quite firm for the first few hundred feet before we hit the sweet corn. Snow conditions were excellent for well over 2000 vft, eventually softening into heavy glop as we dropped into Hidden Valley. There are 2 exit routes from Hidden Valley, one of which involves a 200 vft climb and the other of which is all downhill. Some other skiers were choosing the unnecessary climb, but I had scouted out this area during a ski ascent of Cascade Gulch in mid-May, so I knew about the all-downhill route. We traversed out of the valley and angled downwards across several ridges and gulches to reach Horse Camp by 3 pm. During dinner in Shasta City, we discussed many possible objectives for the next day, eventually settling on Lassen Peak. Our ski route down the West Face is shown in red, including the downhill traversing exit from Hidden Valley back towards Horse Camp. �This photo was taken at 8 pm the evening before the ski descent, from the Abrams Lake Road overpass on I-5 just north of Shasta City. Man, yet another excellent photo Amar! These photos seem to be guidebook quality! Thanks for posting these, it's definately putting a smile on my face before work.